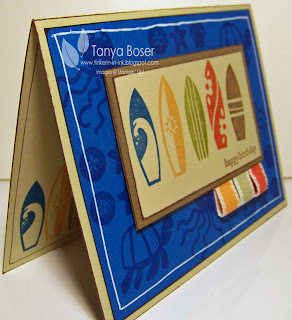 Tinkerin In Ink with Tanya: Pacific Surf!! 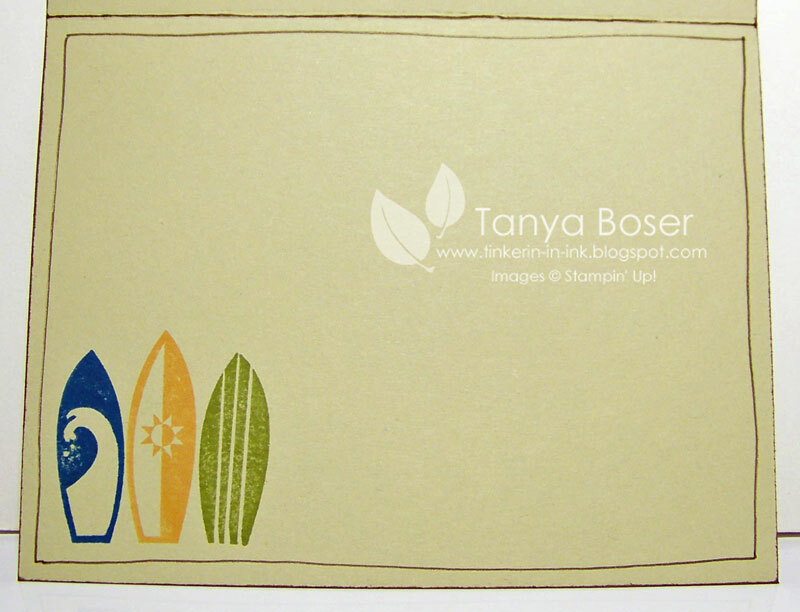 I participated in a swap with the new Summer Mini stamp sets, and this is one of my swap. 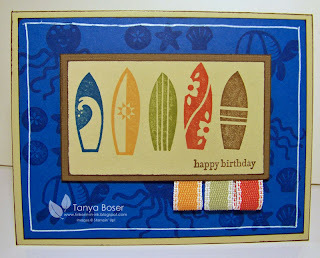 I really love how it turned out :) This is a super fun stamp set called Summer Splash all about the ocean/beach. 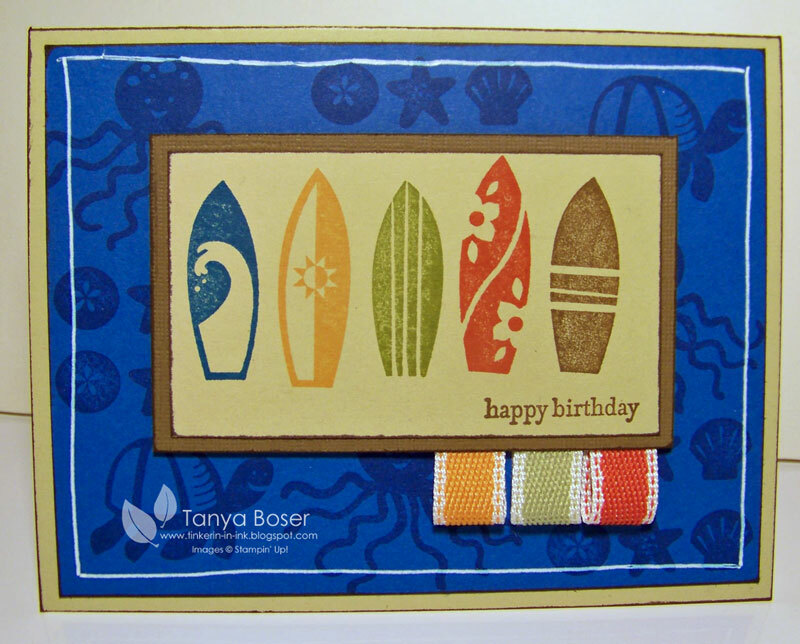 The surfboards are all the same block of stamps, but I got the clearmount version and cut mine apart so I could more easily make them different colors. This is one of those cards that just came together so fast and easily, I just love it! Until next time, I wish I could say "Surf's Up!" but I live in Minnesota. Not too much surfing going on here, lol! Although funny story, my hubby was watching the X Games on TV a few years ago and they had a drawing through our local cable network, and he won!! And the prize was a SURFBOARD with X Games logo on it.... how darn funny is that since we are as far from the ocean as you can get on this continent, being right smack in the middle of it as we are!! You know, I think that silly thing is up in my closet in the box it came in. He had to go pick it up even, they weren't going to pay to have it shipped ;) Ok, now that I remembered this little story, I think I should find that thing, take some pictures, and make a scrapbook page. What do you all think? Definitely tell the story, too funny! Super excited that I have one of these cards! Love the colors and the ribbon! I too own one of these beauties! Fabulous card! 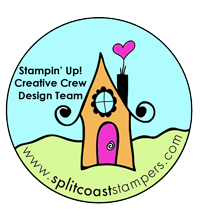 Love the story with your surf board! Definitely the scrapbook page. What a great story! 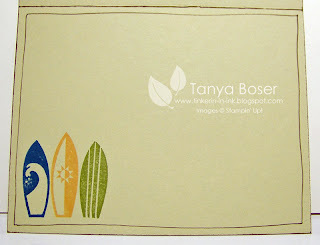 Love the card and the way you used the card base for the water (with all the swimmin' things). I knew this was yours before I checked when I got it! I love it! So whatever happened to that Shopping List?